Rage's creative director has confirmed the lack of always-on DRM, but announced single-player cuts for aftermarket buyers. In recent years, game publishers have made it no secret that they aren't particularly thrilled with the effect that pirating and used game sales have had on their profit margins. In response, they've stuffed games with everything from online passkeys to the ever-loathed always-on DRM, while gamers have had the privilege of playing guinea pig to whatever solutions they come up with. Bethesda's upcoming post-apocalyptic shooter Rage is no exception, and the game's creative director Tim Willits has confirmed what you'll be missing out on if you fail to buy it with the shrink wrap still in place: an entire section of the game's single-player experience. Most people who spend a good part of their day on XBL or PSN have probably already run into the online pass, a special one-use code included with your disc that generally unlocks the game's multiplayer mode once you redeem it. What this means, of course, is that if you ever sell that game after growing bored with it, the unlucky sod who gets it next won't be able to pwn his buddies with that overpowered sniper rifle he unlocked by beating the game until he or she drops what's usually another $10 to $20 on a pass of his or her own. Rage won't be protecting its multiplayer, but it will be using a similar idea for part of its single player campaign. 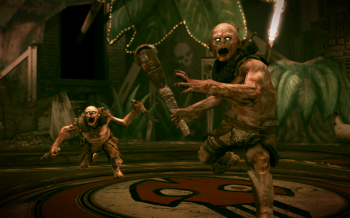 The "sewer hatches," an underground tunnel system that will reportedly bring players to new enemies and missions, will only open up with a brand new copy of the game. When asked about the section that would be cut for aftermarket buyers, Willits said, "[M]ost people never even see it. I can tell you, some people will buy Rage, download that, and still never set foot in those things. They just won't. I think that's fair. It's cool. It's outside the main path. We're not detracting from anything. But I know some consumers, when you can't avoid it, then you get a little touchy subject." Later, in the same interview, he confirmed that while Rage will include its own brand of online pass, it won't include always-on DRM. That doesn't mean we won't see it in other games id Software works on in the future, however, as he did go on to champion its use. With Rage's plan sounding suspiciously similar to some sort of reverse day-one DLC, there're sure to be more than a handful of gamers who take issue with the decision. While publishers do have to take steps to protect their industry, what I don't understand is why Willits is trying to downplay the fun-factor of running through the sewer missions Rage is locking with an online pass. If it's true that "most people will never even see it" and that skipping the section doesn't "detract" anything from your experience, then why would this actually affect whether or not a gamer buys the game new or used?